Click image to see a full size map. 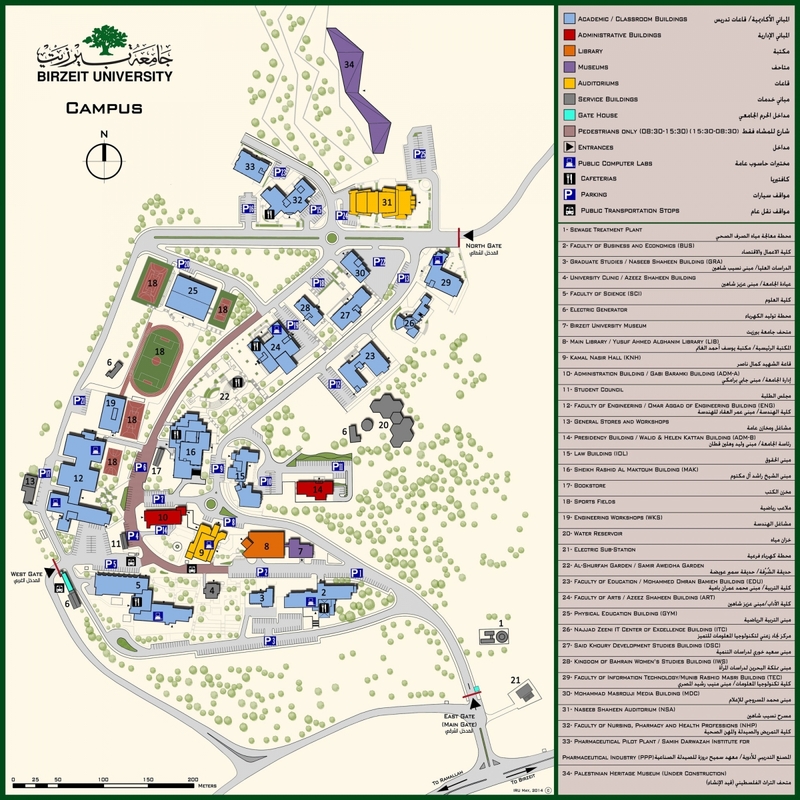 Birzeit University's campus is located on the outskirts of the West Bank town of Birzeit on a hilltop that provides a panoramic view of the surrounding landscape. Its stone buildings blend naturally with the terrain, giving the campus its own special character. Built entirely from donations and sponsorship from Palestine, the Arab world, and abroad, the campus is itself a story of success and a reflection of the confidence of the donor community in the university. Following are the various campus buildings. Construction was completed in 1981 on this building of 10,260 sq. meters which houses the science departments, laboratories and several lecture halls. Construction costs were donated by several contributors. Construction was completed in 1984 on this structure of 12,500 sq. meters which houses the various engineering departments, workshops and laboratories as well as some other faculties. Construction costs were contributed by Mr. Omar Aggad. Construction was completed in 1985 and an annex was completed in 2004 on this structure of 6,128 sq. meters that houses the main library on campus. The building was designed to accommodate more than 700 persons, and houses around 141,000 volumes. The four-story building (A+B) has facilities for students and researchers, with large study halls and a number of private rooms for individual study. The construction costs were contributed by Alghanim Industries in Kuwait. The annex to the library was funded by the Kuwaiti government. Construction was completed in 1985 on this building of 2,025 sq. meters that houses all of the central administration offices as well as the main computer center, the Helen Kattan Computer Center. Construction costs were contributed by Mr. Zein Mayassi and Mr. Walid Kattan. Construction was completed in 1985 on this structure of 1,000 sq. meters. The hall accommodates 288 people and is available to the university community as well as local and international institutions for a range of activities including lectures, conferences and artistic and theatrical performances. The construction costs were contributed by Mr. Abdul Mohsen Qattan and the building named in memory of his friend Kamal Nasir (1925-1973) who was killed in Beirut in an Israeli military raid. Construction was completed in 1993 on this structure of 4,500 sq. meters, which houses the various departments of the faculty as well as several departments of the Faculty of Arts. The construction costs were contributed by Mr. Abdel Rahman Al-Juraysi from Saudi Arabia . Construction was completed in 1998 on this structure of 633 sq. meters, which has two offices for doctors, an emergency room and a sickbay area, as well as a dental unit. The clinic provides day services to the university community. The construction costs were contributed by the late Mr. Azeez Shaheen and other members of his family. Construction was completed in 1998 on this building of 1,630 sq. meters, which houses the Institute's specialized library as well as various offices, teaching rooms and a well-equipped lecture hall with simultaneous translation facilities that can accommodate about 70 people. The construction costs were donated by the French Government and by the Government of Qatar. An annex with an area of 1235 sg. meters was constructed in 2009. Construction was completed in June 2001 on this building of 1,480 sq. meters that houses various graduate studies programs. The construction costs were donated by Dr. Naseeb Shaheen from Ramallah, who presently lives in the US. Construction was completed late 2006 on this structure of 2,794 sq. meters that includes an indoor gymnasium with a seating capacity for 700 spectators as well as training rooms and offices for the physical education program. The construction costs were donated by Mr. Mohamed Imran Bamieh and Mr. Walid Kayyali. The building houses the institute 's administrative offices, classrooms and training hall. Its construction was supported by The Palestinian People's Support Committtee, under the auspices of the Bahrain Chamber of Commerce. Construction was completed in 1999 on this structure of 1,855 square meters that houses the Media Department and the Media Development Center. Its construction was supported by the Diana Tamari Sabbagh Foundation. Donated mostly by Shouky Azeez Shaheen and a number of Palestinian and Arab friends of Birzeit University, the Azeez Shaheen Building - Faculty of Arts was completed in August 2007. It comprises four floors with a total area of 6,700 sq. meters, with a water well with the capacity of 1,000 cubic meters.The ground floor consists of a cafeteria, reading hall (Library), language and computer labs, while the first floor includes a lecture hall that accommodates 220 individuals, three lecture halls (120 students each) and two classrooms. The second floor includes eight classrooms and eight offices for faculty members, whereas the third and fourth floors include the Dean's office and 30 offices for faculty members. On 8 April 2008, the Najjad Zeenni Information Technology Center of Excellence (NZITCE) was inaugurated. The NZITCE was constructed with the generous support of the Palestinian business man, Engineer Najjad Zeenni. It is a two-story building with a total area of 1,220 sq. meters, comprising computer labs, lecture halls and offices. It will serve as an incubator for those working on IT projects, benefiting the greatest possible number of institutions and individuals. Constructed in 2008 with an area of 3611 sq. meters, this building includes the Ibrahim Abu Lughod Institute of International Studies, the Institute of Community and Public Health and the Center for Development Studies. It was funded by Mr. Said Khoury. Constructed in 2009 with an area of 1934 sq. meters, this structure and donated by Mr. Waleed Kattan. Constructed in 2009 with an area of 5,000 sq. meters, the building was funded by Mr. Ghalib Younis. The construction of the building has been completed in February 2013, donated by Mr. Munib R. Masri, It consists of four floors (including the ground floor) with a total area of 4,234 sq. meters, containing 12 classrooms, teaching hall, 10 laboratories for students of computer systems engineering and computer science, 26 faculty and staff offices and a meeting room. The Masrouji building has been completed in May 2013, donated by Mr. Mohamed Mahmoud Masrouji. The Masrouji 6-storey media building with an area of 3,000 sq. meters includes the Media Development Center and Media Department. The first floor includes a library and an audio-visual materials archive. The second floor comprises two radio studios with two control rooms, radio training hall, and two montage units. The third floor includes TV studio, TV training hall and TV montage unit. Whereas, the fourth floor includes the main control room of TV studio, teaching hall, training hall and printed media hall. The 6-storey building Includes 16 Media Development Center .staff and technicians offices. The field measures 80m x 50m with racing tracks. It was completed in October 2004 and donated by Mr. Munir Atallah. A total of 5,250 sq. meters constructed with a "soft" loan by the Islamic Development Bank and completed in December 2004. Construction was completed in 1984 on the ground floor and in 1995 on the first floor on this building of 1,790 sq. meters that houses faculty of engineering workshops on its ground floor and the department of Languages and Translation on the first floor. Construction costs were contributed by Omar Al-Aggad. Construction was completed in 1997 on this reservoir of 3,000 cubic meter. It supplies the campus buildings and firefighting networks. It is part of a water project to utilize rain water and is supported by the Arab Fund for Economic and Social Development. Construction was completed in 1982 on this treatment plant that receives and treats wastewater from all buildings in the university. It has a maximum capacity of 600 cubic meters a day. Construction was completed in 2002 on this workshop of 340 sq. meters that houses the civil, electrical and mechanical workshops of the university. Construction was completed in 1984 on this structure of 100 sq. meters that houses the guards of the university and two stand-by diesel generators of 850 KVA capacity that work as emergency sources of power for the rest of campus buildings.